Starting a saltwater aquarium is more difficult and costlier than your typical freshwater setup, but the remarkable beauty and unique personalities of saltwater fish makes it a worthwhile venture for most hobbyists. If you don’t want to dive into the deep end right off the bat, it’s not a bad idea to start with some saltwater fish for beginners that are just a bit easier to take care of. Before you even think about buying an aquarium, you need to ensure that you have room in your house for the tank to be away from direct sunlight. Frequent exposure to direct sunlight will cause algae growth to explode, affecting the overall health of your fish. Once you have a spot picked out, you are ready to start thinking about aquariums. Some people like to start small and upgrade when they are comfortable, but I don’t recommend this. Saltwater setups are tough and moving your fish around causes stress that could become fatal. Instead, I recommend purchasing an aquarium that will fit your fish selection when fully grown. When you’re ready to pick out substrate, ensure that your choices will fit the needs of your fish. Some fish like to burrow, so you should choose fine sand over coarse sand that could scratch delicate skin. A good rule of thumb is 1 lb of substrate per gallon of water to give the ideal 1-inch gravel bed. 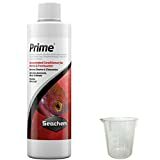 Any water that enters your aquarium needs to be treated with an appropriate treatment like Seachem Prime (pictured below). You’ll also need to add marine salt by using a premixed solution or marine salt granules purchased from a pet store. You should never use table salt as it often contains iodine which is toxic to invertebrates. To start, only fill the aquarium ⅓ of the way so you can test the gravity of the water with a hydrometer. Once completed, the specific gravity (sg) of the water should read 1.025. Once your aquarium is full of water, you should let the filtration and heater run for at least 24 hours before moving onto the next step to ensure they are working properly. At this point, you can begin adding cured live rock and saltwater plants. No fish should be added until the aquarium has fully cycled. This process is similar to freshwater cycling where an ammonia source is added to the water to start the cycle and the development of beneficial bacteria. During this time, you should plan to do 50% water changes weekly. Within 4-6 weeks, the aquarium should complete a full cycle with ammonia and nitrite levels at 0 ppm, nitrates around 10 ppm with a healthy pH between 8.1 and 8.4. Add fish slowly so they become properly acclimated and ensure your choices can live in harmony together to avoid aggression and stress. It’s a lot of work, and there’s a popular misconception that you can just fill a tank with water and toss your fish it – unfortunately, that belief leads to a lot of dead fish. You should take this initial process very seriously, and be patient with it. Make sure everything is good, because it’s much easier to adjust things before you have fish counting on you for their lives. What Makes A Good Beginner Saltwater Fish? Two words: Hardy and peaceful. Inexpensive is important too, but most saltwater fish are on the pricier side, so I’ve decided to focus my attention on hardy and peaceful instead. Tangs are a bold and colorful saltwater fish that are a great choice for beginners thanks to their hardiness and typically non-aggressive nature. They exist in a variety of colors, ranging from yellow to blue. When fully grown, a Tang typically reach 12 inches in length. Tangs prefer a water temperature ranging between 72°F – 82°F. Due to their large size, you will need an aquarium that holds at least 100 US gallons but like with most fish, larger is always recommended. Although they are schooling fish in their natural habitat, they can become quite aggressive with other Tangs if they are not in a large enough aquarium. For this reason, it is recommended that you avoid having multiples unless you can offer them the space they require and can commit to purchasing them at the same time. Tangs are omnivores and will enjoy a varied diet of krill, algae, brine shrimp, and flake food. When it comes to eating, Tangs are grazers and will eat a lot of food throughout the day. A well-cared for Tang can live anywhere from 8 – 20 years. The Firefish Goby is a popular choice for new hobbyists because they don’t require a huge aquarium and they are almost completely non-aggressive. You might notice signs of aggression in aquariums that are too small or crowded or when kept with other fish of the same species. It’s recommended that tankmates are a different saltwater species and slow-moving, like the Clownfish. By adulthood, most Firefish Gobies reach 3 inches in length. Firefish Gobies prefer a water temperature that falls within the range of 72°F – 82°F with a pH of 8.1 – 8.4. The recommended aquarium size for one Firefish Goby is 20 US gallons. Firefish Gobies are omnivores and like to eat algae, zooplankton, and an assortment of meaty options like Mysis shrimp, finely chopped seafood, and Brine shrimp. These little guys are incredibly shy and will spend the first few days in a new environment hiding so don’t fret if you don’t see them right away. For added comfort, use low lighting and fine sand as they might try to bury themselves and could get injured by coarse substrate. The typical lifespan for a Firefish Goby is 3 years. Blenny Fish are known for being one of the lowest maintenance options when it comes to saltwater fish. People who own a Blenny Fish describe them as being comical and entertaining due to their cute size and quirky appearance. They are another small option as they only reach 3 inches by adulthood so they are a great option if you don’t want to commit to a large aquarium quite yet. Blennies prefer warmer water in the range of 75°F – 84°F with a pH of 8.0 – 8.4. These active bottom dwellers will thrive in an aquarium that is at least 20 US gallons with plenty of places to hide and burrow in the substrate. These guys love to eat, and you should have no trouble feeding them a balanced diet of high-quality marine flakes, brine shrimp, and other fresh or frozen food. The average lifespan of a healthy Blenny is 3 years. Watchman Goby are known for being a hardy fish that’s perfect for a Nano setup. It’s recommended that you pair your Watchman Goby with a Pistol Shrimp to best replicate their natural environment. They have an interesting bond that is difficult to find in other fish – they will actually share a burrow where the Watchman Goby acts as the Pistol Shrimp’s guardian. When fully grown, a Watchman Goby can reach up to 3 inches in length. Watchman Gobies need to live in water that is heated between 72°F – 78°F with a pH of 8.0 – 8.4 and salinity of 1.020 – 1.025. A minimum 20 US gallon tank is recommended for these guys and they’re completely non-aggressive. Their diet is mostly made of Mysis Shrimp but they are scavengers by nature so they will eat most of what falls onto the aquarium floor. Like most Nano-sized fish, the Watchman Goby lives 3 – 5 years on average. Pajama Cardinalfish get their name from the distinctive red polka dots on the lower-end of their white bodies resembling a pair of pajama pants. They are a popular choice for beginners because they have calm temperaments and are relatively hardy. They should be kept away from larger saltwater fish who could make a snack out of them, and away from fish of the same species to avoid aggression. When fully-grown, they should reach 3 inches in length. Pajama Cardinalfish are on the hardier side when it comes to saltwater fish and prefer a water temperature of 72°F – 80°F with a pH of 8.1 – 8.4. They are considered reef safe and should be kept in a minimum 30 US gallons. Unlike most of the options on this list, Pajama Cardinalfish are mostly carnivorous so their diet should be made primarily of meaty foods. Some people have reported that they don’t take well to flake food but seem to enjoy fresh or frozen Brine shrimp and Mysis shrimp. When living in ideal conditions, most Pajama Cardinalfish will live 5 years or longer. Clownfish are one of the most well-known saltwater fish available to hobbyists. Like the Blue Tang, Clownfish grew in popularity after the release of the movie Finding Nemo in 2003 and they’re still popular today, years later. They’re also one of the easiest saltwater fish to care for because they don’t need a huge aquarium to thrive and they’re one of the hardier options available. When fully grown, you can expect your Clownfish to reach anywhere from 2 – 5 inches in length. Clownfish are a tropical fish needing a water temperature between 72°F – 78°F with a pH range of 8.0 – 8.4 and a salinity of 1.020 – 1.025. It’s recommended that you keep your Clownfish in an aquarium that is 20 US gallons with plenty of hiding places. To best replicate their natural environment, you should consider keeping sea anemones in the aquarium, but they can sting human hands so you should wear gloves while handling. Clownfish are considered non-aggressive and should be fine with most tankmates as long as they can’t be eaten by them. Their diet consists of live and frozen foods like brine shrimp or krill and vegetables. Spinach and nori are both popular choices that will help your Clownfish eat a balanced diet. The average lifespan for a Clownfish living in captivity is between 3 – 5 years. Coral Beauty Angelfish are popular in the saltwater fish community because of their remarkable beauty and hardiness. They are commonly seen in vivid shades of red, orange, yellow, blue and purple and remain colorful through adulthood. When fully grown, most Coral Beauty Angelfish grow to become 4 inches in length. Coral Beauty Angelfish prefer their water to be a bit toasty at 74°F – 82°F with a pH range of 8.1 – 8.4 and a salinity of 1.020 – 1.025. The minimum aquarium size you should buy for a Coral Beauty Angelfish is 40 US gallons. This will ensure that your Coral Beauty Angelfish has plenty of room to move around and avoid episodes of aggression. You should only keep one Coral Beauty Angelfish in your aquarium, but you can keep them in a community tank with Damselfish, Tangs, Blennies, and Cardinals. Coral Beauty Angelfish are omnivores who eat mostly vegetable matter. Their diet consists of invertebrates, algae, frozen shrimp, and high-quality pellets, flakes, or tablets. Coral Beauty Angelfish have a longer life expectancy than most of the fish on this list at a long 10 – 15 years. Chalk Bass are a very peaceful saltwater fish making them an ideal choice for a beginner hobbyist. They are also known for being incredibly tough little guys and should be easy to keep alive with the right care. A unique trait about this fish is that they can change their usual orange and blue coloring to camouflage themselves from potential predators. At adulthood, these fish typically reach 2 – 3 inches in length. Compared to the other saltwater fish on this list, Chalk Bass prefer a bit of a cooler temperature at 72°F – 76°F with a pH range of 8.1 – 8.4 and a salinity of 1.020 – 1.0250. To give them enough space to swim and hide amongst a variety of coral, a minimum 30 US gallon aquarium is recommended. As they are peaceful fish, they should be fine in a community tank. Like with most small fish, caution is advised when keeping them with larger saltwater fish. Their diet is completely carnivorous, and they will eat invertebrates that are smaller than them so keep that in mind if you were hoping to keep them together! For a balanced diet, you can feed them Mysis shrimp or Brine shrimp, fish pellets, frozen or live food, and krill. When living under ideal conditions, many a Chalk Bass can live between 8 – 12 years. Like with any aquarium set up, look for signs of illness prior to purchasing fish. This could include lethargy, bulging eyes, scratches or open sores, unexplained white spots, torn fins, and more. Setting up a saltwater aquarium can be expensive and more work than the traditional freshwater tank, but the beauty and unique features of each saltwater fish more than make up for it. There are many unique and beautiful freshwater fish, but some of the saltwater ones you’ll see are just breathtaking. Just realize it’s a lot of work to set things up initially, and also a lot of work for the on-going maintenance.